​No one predicted the chain of events triggered by Jenny's discovery of her fiancé's body in his library. Least of all her chance to find true love. 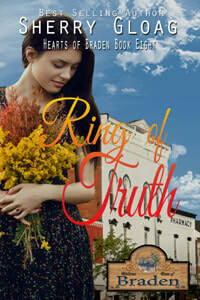 "I loved Sherry's contribution, just the right amount of society intrigue, passion and jewellery for me! Can't wait to read more." "The Respectable Charades by Sherry Gloag was a fascinating and poignant story with strong characters and message. Loved it!" Will Sybil Diamond’s future be determined by diamonds? ​Top-level poker player Sybil Diamond isn’t phased when challenged to play against Culley Maccailin – until she loses. The stake is astronomical… Her heart. "I read this story as part of an anthology. 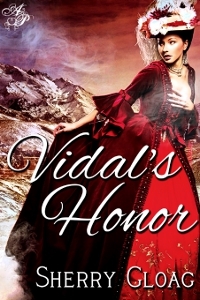 It's a sweet-romance regency filled with well-developed characters and plenty of action. I don't believe in reviews that contain spoilers or repeating what you can read in the blurb, but I recommend this story...enough that I intend to buy another of Ms. Gloag's books!" 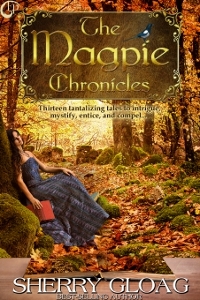 A collection of thirteen mixed genre short stories based on the well-known Magpie Rhyme. One for sorrow, Two for joy, Three for a girl, And four for a boy, Five for silver, Six for gold, Seven for a secret never to be told. Eight for a wish, Nine for a kiss, Ten a surprise you should not miss. Eleven for health, Twelve for wealth, Thirteen beware of the devil himself. ​All her life, Emma has shared a special affinity with dogs, communicated with them in an extraordinary way. A bond it seemed her son would share when an aging husky took on the role of his protector. But it’s been six months since Shane last had a dog in his life. With each day that passes, Emma grows increasingly anxious. While she doesn’t understand why, she knows it has something to do with the lack of a dog as Shane’s guardian. She certainly didn't expect Shane’s absentee father to return and solve the problem. Noelle McBride considers her independence is worth more than a broken promise, and a catalogue of lies, and an eight million pound ruby and diamond ring. Reed Tanner intends to prove her wrong. Noelle woke to find a stranger staring down at her, hatred in her eyes. "Where is it? I know you have it, and it's mine." Struggling to overcome the painkillers still fogging her brain, Noelle gaped at the woman. "Who are you? What are you're talking about?" Something about her actions, fiddling with her drip, cleared the fog from her mind. Renowned portrait artist, Samantha Brown is through with men. After dealing with an overbearing father and cheating ex-fiance, Samantha is not in the market for romance, of any kind. Satisfied with his upcoming marriage of convenience Rafael Santini isn’t in the market for love. So, how come he finds the pint-sized artist stirring up emotions he didn’t have time for? An accident forces Rafael to re-evaluate his life and wonder whether he can teach Samantha the art of love. a novella, not a novel." "A delicious romance between the hunky Liam and the sassy independent heroine. "This sweet romance will keep you on your the edge of your seat. I was intrigued by the characters and the plot. Ms. Gloag knows how to pack a punch." "Sherry Gloag’s story is one that picked me up and did not put me down until I finished it. Definitely a breath of fresh air." "I found "His Chosen Bride" a very delightful read and if you are in for a good romance this read is for you. This novel was one that I could not put down until I was finished." "What makes this novel really memorable is the way that Sherry Gloag skilfully crafts her characters. The relationship between the main characters, Rafe Kinsale Hawk and Trudi Delaney, forms the core of the novel. The supporting cast of characters really enhances the storyline and produces a well-rounded novel that is truly a pleasure to read. Congrats to author extraordinaire, Sherry, for this amazing book. " "This was a story about the importance of family and love, and it was beautifully done. I really enjoyed reading this, and certainly wouldn’t hesitate to read another of Ms. Gloag’s novels." with a twist of suspense. "Ms. Gloag's writing is stylish, gentle (given the subject-matter), almost poetic at times and she manages to engage the reader's emotions with apparently little effort. On the whole this is an enjoyable non-traditional romance that needs more than a little concentration, and the unexpected ending is pure delight - it makes you want to go back to the beginning and start again. It's highly recommendable."